I am in the middle of a one of my big Sully Baseball blog post series. I want to honor each pitcher who has ever clinched a post season series. I've already done it for the Red Sox and the Phillies. But as I started up writing each team's entry, I realized that I should write a separate post about each player to end a post season series with a walk off hit. Then another bizarre revelation hit me. I needed to create a whole new category. Some series didn't end with an out to clinch. Some series didn't end with a walk off hit or sacrifice fly. Some had stranger endings. There are a few wild pitches, a bases loaded walk, a caught stealing and even one series ending with a base hit by the LOSING team. So let's list them here. The strange and difficult to categorize finishes to post season series. 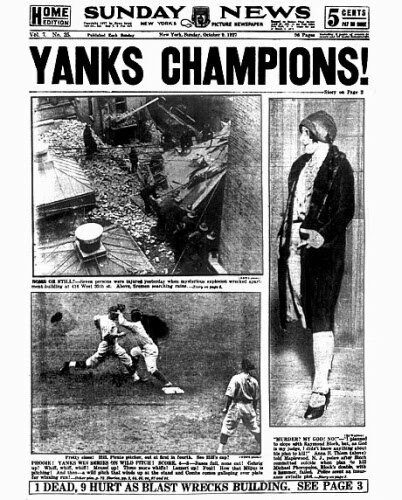 Babe Ruth is caught stealing to end the World Series. One of the most memorable games in World Series history ended in a truly bizarre and anticlimactic manner. The Yankees and Cardinals went back and forth in a do or die Game 7 that featured Grover Cleveland Alexander coming out of the bullpen on no days rest to strike out Tony Lazzeri with the bases loaded in the 7th. In the bottom of the 9th with St. Louis clinging to a 1 run lead and 2 outs, Babe Ruth walked and represented the tying run. Hard hitting Long Bob Meusel was at the plate, the man who led the league in home runs and RBI just the year before. It was a classic confrontation against the future Hall of Famer Alexander. Except it never happened. Ruth, never known as a speed demon, took off to steal second and put himself in scoring position. 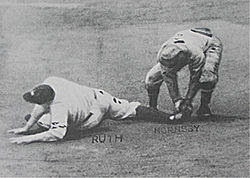 Cardinals catcher Bob O'Farrell threw to second baseman and manager Rogers Hornsby and Ruth was nailed. The World Series was over with the greatest Yankee looking like a dope on the ground. The 1927 Yankees were considered for generations to be one of if not THE greatest team of all time. They won 110 out of 154 games, had Babe Ruth slug 60 homers and Lou Gehrig chipped in with 47 of his own with a .373 average. They were Murderers Row and had a solid pitching staff to boot. They finished 19 games ahead of the Philadelphia Athletics for the pennant and went on to sweep the Pirates in the World Series. But to be fair, the Pirates didn't just lay down to the Yankees. Game 1 and 4 were one run games and it was a Pittsburgh mistake, not Yankee power, that clinched it. With the score tied in the bottom of the 9th of Game 4, Pirates pitcher Johnny Miljus walked Earle Combs to lead it off. After a single and a wild pitch, he walked Babe Ruth intentionally. He then struck out Lou Gehrig and Bob Meusel and looked like he was going to get out of the jam. But facing Tony Lazzeri, he threw his second wild pitch of the inning, scoring Combs and winning the World Series. Murderers Row had won the World Series on a rally where the ball never left the infield. The 1972 Pirates were the Defending World Champions and looked ready for a return date in the World Series where they would face the winner of the A's and Tigers ALCS. They had a 3-2 lead in the bottom of the 9th and Dave Giusti, the NL leader of saves in 1971 and had posted 22 in 1972, was on the mound. But Johnny Bench hit a lead off homer to tie the game and Tony Perez and Denis Menke both singled, suddenly putting Cincinnati in the position to win the pennant. Bob Moose came in and got Cesar Geronimo and Darrel Chaney out. 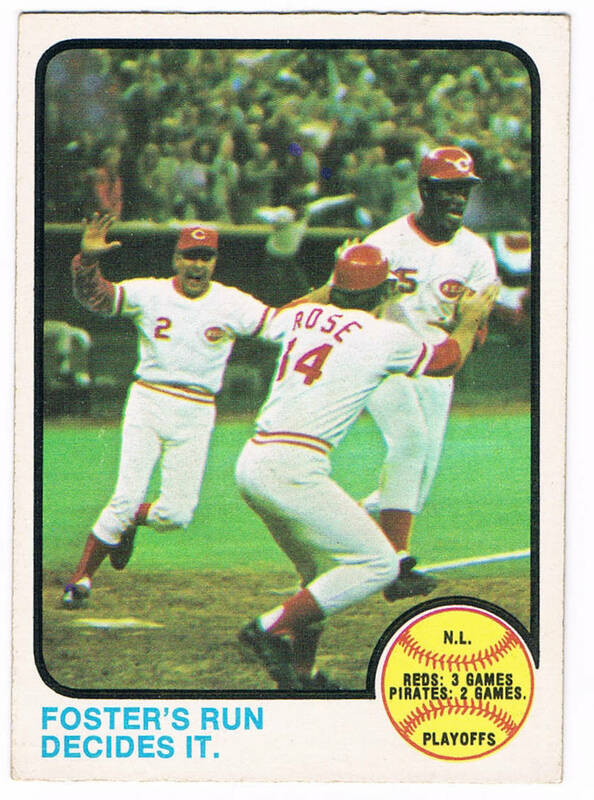 Meanwhile pinch runner George Foster moved to third when Hal McRae came to the plate as a pinch hitter. Moose let a pitch get away scoring Foster and sending the Reds to the World Series. The Pirates, the only team to lose a post season series on a wild pitch, pulled off the feat twice. The 1999 NLCS was one of the wildest, most unpredictable and heart stopping playoff series I have ever seen. The Mets lost the first three to the Braves in agonizingly close games including a 1-0 bang your head against the wall Game 3. The Mets won a 15 marathon Game 5 where they were 3 outs from elimination and Robin Ventura hit his "Grand Slam Single." Then the Mets came back from a 5-0 first inning hole to send Game 6 into extras. They had a chance to be the first team to be down 3-0 to force a Game 7. In the bottom of the 11th, Mets pitcher Kenny Rogers let up a lead off double to Gerald Williams and a sacrifice by Bret Boone put the Braves pennant on third with one out. Mets manager Bobby Valentine ordered a pair of intentional walks hoping to set up a force at home. 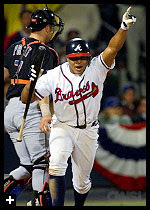 But Rogers never found his control and walked Andruw Jones to bring in the pennant winning run. The idea of walking in the winning run will always boggle my mind. How can a pitcher not just throw it down the heart of the plate? The worst case scenario is a walk off grand slam. But make the HITTER connect with it. Instead a series filled with come from behind rallies and starting pitchers coming out of the bullpen ended with a thud. The Giants responded to their heart breaking 2002 World Series loss with a powerhouse 2003 season where they ran away with the NL West and looked like the team to beat. The Wild Card Marlins, who eliminated the Giants in 1997, didn't look to pose much of a threat. But Florida came back to win Game 2 and won Game 3 in extra innings when they were one strike from losing. In Game 4, Dontrelle Willis and the Marlins jumped ahead to a 5-1 lead but the Giants tied the game and it remained so until the 8th. In the bottom of the 8th the Marlins took the lead, in part when Pudge Rodriguez crashed into Yorvit Torreabla at home plate, jarring the ball loose. In the 9th inning the Giants rallied and put the tying run at second base in the form of J. T. Snow. Manager Felipe Alou had run out of pinch runners, but that wouldn't be a factor, right? Jeffrey Hammonds hit a single to left and Snow rounded third to try and tie the game. Jeff Conine threw home to Rodriguez who made the tag and held onto the ball after the collision. That was the clear difference between Torreabla and Rodriguez. It was not only the first time a post season series ended with the tying run being thrown out at the plate but it is the only time a series ended with the losing team getting a hit. I was in my bedroom listening to the game on the radio, putting on my tuxedo getting ready for my wedding. When the series was over, I looked at my mom who was helping me with my cuff links. We raised our eye brows, shrugged and I put my shoes on. So there you have 5 series whose endings defy regular categories. None were walk off hits. None were the pitcher recording the final out. All were agonizing for the losing team and no doubt made the winning team think "Oh boy, we got away with one." I'm a diehard baseball fan - but, not the most sabermetrically inclined one. I know just enough to be dangerous and little enough to easily make a fool of myself.